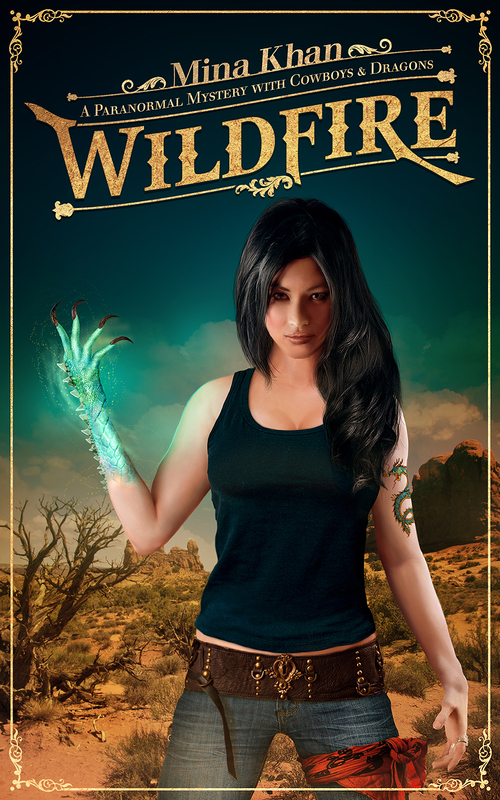 Paranormal romance author Mina Khan has set her pen a-fire once more and has spun for us a daring tale, Wildfire, a fabulous new paranormal mystery complete with cowboys and dragons. Intrigued? I was eager to see the twist on how cowboys and dragons coincided and had to get my grabby hands all over this one. Reporter Lynn Alexander is a feisty shape-shifting dragon who isn’t afraid of her dragon abilities. Yet doubt and fear threaten to stifle those abilities the moment she fails to save her grandmother from a massive fire. Though the more she thinks about it, the more she’s convinced that something about her grandmother’s death doesn’t feel right but Lynn has more pressing problems to attend to and keeping her best friend safe is at the top of that list. Why does it seem that problems always threaten to derail her best intentions? And why after dumping her lying, cheating fiancé is she being distracted by dragon pheromones and the mysterious cowboy who sets her heart racing? Incorporating her twist on the beautiful yet tragic Japanese kiyohime tale, Khan has answered all those questions and more. This pulse-throbbing, page turning mystery captured my attention from page one and refused to let go until the very end. At chapter four, I contacted the author via Facebook and begged for a sequel. I wanted more, had to have more. Lynn is smart, sassy, and at times careless but she is courageous, flying in the face of danger to answer the call for help. The two leading men Henry and Jack keep Lynn on her toes. They’re all at once charming, fun to be with, dangerous and push her heat index off the charts. Khan’s well paced story offers the reader tender morsels of clues at every turn pulling the reader in ever so slowly, pushing us in different directions with a few twist and turns along the way but still manages to never lose sight of the deepening mystery. And just when you think you’ve got it all figured out, a new detail throws you off leaving you to wonder just what is going on. And yes, a sequel is in the works! Wildfire is a well written, intriguing paranormal mystery with fascinating scenery, enticing cuisine and just enough romantic elements sprinkled throughout. I’d say I had my cake and ate it too. This entry was posted in Books, new release and tagged cowboy, Dragon, mystery, Paranormal romance, shape-shifting. Bookmark the permalink. Well, I’m sold! Heading over to buy this right now.